Bicyclists are rarely at fault for causing cycling accidents, according to a recent study commissioned by the British government. In Britain, as here in Chicago, there is a misconception that bicyclists engaging in "rogue" behavior, like blowing through stop signs, are usually at fault for causing their own injuries. However, the study revealed that drivers' failure to look out for bicyclists is the primary cause of serious accidents. The Guardian originally reported this story. I was made aware of it via Urban Velo's website. Below is an excellent video created via a partnership between the Chicago Transit Authority (CTA) and the Chicago Department of Transportation about buses and bicyclists sharing the road. The video was made for bus operators and bicyclists to highlight safety issues and offer practical guidance on how to avoid accidents. Along with the recently created bicycling video created by the Chicago Police Department, the CTA video should be required viewing for all city motorists and bicyclists. It is also important viewing for attorneys representing bicyclists in as much as it evidences what the CTA considers the standard of care to be for its bus operators when dealing with cyclists on the roadway. Share the Road - Buses and Bicycles from Chicago Bicycle Program on Vimeo. And now the latest score: Bus 1, Bike 0. No surprise. Until the new bulletproof Krypyonite (sic.) bikes are marketed bike users need to be more careful. Might usually makes right and busses (sic.) are pretty mighty. Our nation is afflicted with a plague of bicycles. Everywhere the public right-of-way is glutted with whirring, unbalanced contraptions of rubber, wire, and cheap steel pipe. Riders of these flimsy appliances pay no heed to stop signs or red lights. They dart from between parked cars, dash along double yellow lines, and whiz through crosswalks right over the toes of law-abiding citizens like me. In the cities, every lamppost, tree, and street sign is disfigured by a bicycle slathered in chains and locks. And elevators must be shared with the cycling faddist so attached to his "moron's bath-chair" that he has to take it with him everywhere he goes. In the country, one cannot drive around a curve or over the crest of a hill without encountering a gaggle of huffing bicyclers spread across the road in suicidal phalanx. Even the wilderness is not safe from infestation, as there is now such a thing as an off-road bicycle and a horrible sport called "bicycle-cross." The ungainly geometry and primitive mechanicals of the bicycle are an offense to the eye. The grimy and perspiring riders of the bicycle are an offense to the nose. And the very existence of the bicycle is an offense to reason and wisdom. Bicycles have their proper place, and that place is under small boys delivering evening papers. Insofar as children are too short to see over the dashboards of cars and too small to keep motorcycles upright at intersections, bicycles are suitable vehicles for them. But what are we to make of an adult in a suit and tie pedaling his way to work? Are we to assume he still delivers newspapers for a living? If not, do we want a doctor, lawyer, or business executive who plays with toys? St. Paul, in his First Epistle to the Corinthians, 13:11, said, "When I became a man, I put away childish things." He did not say, "When I became a man, I put away childish things and got more elaborate and expensive childish things from France and Japan." Considering the image projected, bicycling commuters might as well propel themselves to the office with one knee in a red Radio Flyer wagon. A certain childishness is, no doubt, excusable. But going about in public with one's head between one's knees and one's rump protruding in the air is nobody's idea of acceptable behavior. It is impossible for an adult to sit on a bicycle without looking the fool. There is a type of woman, in particular, who should never assume the bicycling posture. This is the woman of ample proportions. Standing on her own feet she is a figure to admire-classical in her beauty and a symbol, throughout history, of sensuality, maternal virtue, and plenty. Mounted on a bicycle, she is a laughingstock. In a world where loss of human dignity is such a grave and all-pervading issue, what can we say about people who voluntarily relinquish all of theirs and go around looking at best like Quixote on Rosinante and more often like something in the Macy's Thanksgiving Day parade? Can such people be trusted? Is a person with so little self-respect likely to have any respect for you? Bicycles are top-heavy, have poor brakes, and provide no protection to their riders. Bicycles are also made up of many hard and sharp components which, in collision, can do grave damage to people and the paint finish on automobiles. Bicycles are dangerous things. Of course, there's nothing wrong, per se, with dangerous things. Speedboats, racecars, fine shotguns, whiskey, and love are all very dangerous. Bicycles, however, are dangerous without being any fun. You can't shoot pheasants with a bicycle or water-ski behind it or go 150 miles an hour or even mix it with soda and ice. And the idea of getting romantic on top of a bicycle is alarming. All you can do with one of these ten-speed sink traps is grow tired and sore and fall off it. Being dangerous without being fun puts bicycles in a category with open-heart surgery, the war in Vietnam, the South Bronx, and divorce. Sensible people do all that they can to avoid such things as these. We are a nation that worships speed and power. And for good reason. Without power we would still be part of England and everybody would be out of work. And if it weren't for speed, it would take us all months to fly to L.A., get involved in the movie business, and become rich and famous. At least I think I don't. I don't actually know anyone who rides a bicycle. But the people I see on bicycles look like organic-gardening zealots who advocate federal regulation of bedtime and want American foreign policy to be dictated by UNICEF. These people should be confined. I apologize if I have the wrong impression. It may be that bicycle riders are all members of the New York Stock Exchange, Methodist bishops, retired Marine Corps drill instructors, and other solid citizens. However, the fact that they cycle around in broad daylight making themselves look like idiots indicates that they're crazy anyway and should be confined just the same. Bicycles use the same roads as cars and trucks yet they pay no gasoline tax, carry no license plates, are not required to have insurance, and are not subject to DOT, CAFE, or NHTSA regulations. Furthermore, bicyclists do not have to take driver's examinations, have eye tests when they're over sixty-five, carry registration papers with them, or submit to breathalyzer tests under the threat of law. And they never get caught in radar traps. The fact (see No. 5, above) that bicycles are ridden by the very people who most favor government interference in life makes the bicycle's special status not only unfair but an outright incitement to riot. Equality before the law is the cornerstone of democracy. Bicycles should be made to carry twenty-gallon tanks of gasoline. They should be equipped with twelve-volt batteries and a full complement of taillights, headlamps, and turn signals. They should have seat belts, air bags, and safety-glass windows too. And every bicycle rider should be inspected once a year for hazardous defects and be made to wear a number plate hanging around his neck and another on the seat of his pants. And so is swinging through trees on your tail. Mankind has invested more than four million years of evolution in the attempt to avoid physical exertion. Now a group of backward-thinking atavists mounted on foot-powered pairs of Hula-Hoops would have us pumping our legs, gritting our teeth, and searing our lungs as though we were being chased across the Pleistocene savanna by saber-toothed tigers. Think of the hopes, the dreams, the effort, the brilliance, the pure force of will that, over the eons, has gone into the creation of the Cadillac Coupe de Ville. Bicycle riders would have us throw all this on the ash heap of history. What must be done about about the bicycle threat? Fortunately, nothing. Frustrated truck drivers and irate cabbies make a point of running bicycles off the road. Terrified old ladies jam umbrella ferrules into wheel spokes as bicycles rush by them on sidewalks. And all of us have occasion to back over bicycles that are haplessly parked. Bicycles are quiet and slight, difficult for normal motorized humans to see and hear. People pull out in front of bicycles, open car doors in their path, and drive through intersections filled with the things. The insubstantial bicycle and its unshielded rider are defenseless against these actions. It's a simple matter of natural selection. The bicycle will be extinct within the decade. And what a relief that will be. I wonder if P.J. O'Rourke's childish complaints about bikes and those "organic-gardening zealots" who ride them were actually made to ridicule those who, in all seriousness, protest with red-faced hysteria about the "bicycle menace." Perhaps he was creating a satirical strawman. I don't know. Regardless of whether P.J. O'Rourke meant what he wrote or not, I have enough experience as a bicyclist and a lawyer representing bicyclists to know that a great many motorists do believe strongly in the viewpoints set forth in the essay. How are these unreasonable folks to be dealt with? RIDE -- O'Rourke's cheeky predication did not come true, of course. Far from disappearing from American roadways, bicyclists' numbers are increasing. Our new Secretary of Transportation, Ray LaHood, seems committed to policies meant to increase our numbers even more. The future looks bright for bicyclists. Continue to ride. Recruit others to ride. The more people ride, the louder our collective voice will become and the more likely it is that those who are in a position to initiate change -- and fund and build "complete streets" -- will take notice and respond. ADVOCATE -- Truth is, riding alone will not affect change. A safer and smarter traffic infrastructure will come about with organization. Motorists who think bicyclists do not belong on our streets will not learn better without it either. Join some of the many excellent, committed groups out there actively fighting on behalf of bicyclists. Many of these groups are staffed by smart, committed people who have the ear of legislators. They give bicyclists access to the mechanisms of change. A list of many such groups are listed down the right side of this blog. Locally, I recommend the Active Transportation Alliance. It is a fantastic group of Chicago bicyclists for Chicago bicyclists. FIGHT -- Motorists should be placed on notice that negligent conduct comes with consequences. If you open your door without looking, make a right turn without paying attention, fail to give cyclists three feet of space, or otherwise drive like a knucklehead and hurt a bicyclist you will be sued. You will pay for your mistake. 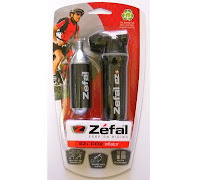 The U.S. Consumer Product Safety Commission has announced the recall of a bicycle tire inflator, the Zefal EZ+ CO2 Inflator. "The pressurized cartridge containing carbon dioxide (CO2) can forcefully separate from the pump head, posing a risk of injury to the consumer," said the Commission. So, if you have one of these suckers, stop using it. Chicago Police believe that the 32 year old bicyclist who was struck and killed by a van in Logan Square yesterday was the victim of a road rage incident between two motorists. The bicyclist, Jepson Livingston, on his way to fill out job applications. Read more from the Chicago Breaking News Center here. The Chicago Breaking News Center is reporting that a man on a bicycle was struck and killed by a van near the 3800 block of West Diversey Avenue in the city's Logan Square neighborhood yesterday. The bicyclist was 32. Chicago bicyclists are a hardy bunch. Even in the freezing cold of winter there are plenty of bicyclists on the road. Please remember to always check your rear view mirror before exited your vehicle when you park on the street. Opening a vehicle door into a cyclist's path is extremely dangerous and can cause serious injury and even death. In the past I've written about steps bicyclists can take to avoid getting doored. Recently, I found the stylish and amusing video below on the Urban Velo website which I hope will serve as a reminder about the serious danger carelessly opened car doors present to bicyclists. Parents of young children just learning to ride a bicycle worry about injuries. A small child on a bicycle or tricycle can be especially difficult for a motorist to notice. Also, young kids tend to be fearless to a fault. On the other hand, parents tend not to focus so much the harm a young child on a bicycle could cause to others, and the liability that may arise from a child's early efforts at staying upright on a bike. This wasn't a topic on my mind until I came across a 2001 case from the Illinois Appellate Court's second district, Appelhans v. McFall, 325 Ill.App.3d 232 (2nd Dist. 2001). In that case, a 66 year old woman was walking along the edge of a roadway when a five year old boy rode up on his bicycle and struck her from behind, causing her to fall and fracture her hip. In her subsequent lawsuit, the woman alleged that (1) the boy was negligent in the manner in which he rode his bicycle; (2) his parents failed to instruct him on how to properly ride his bike; and (3) his parents failed to "supervise him while he rode his bicycle on a public roadway because they knew or should have know that his youth would prevent him from considering the safety of pedestrians." Appelhans, 325 Ill.App.3d at 234. The trial court dismissed all three of the woman's allegations and the Illinois Appellate Court affirmed that decision. With regard to the allegation that the boy himself was negligent, the court reaffirmed the well-established "tender years doctrine." The court stated, "The rationale for the tender years doctrine is the belief that a child under the age of seven is incapable of recognizing and appreciating risk and is therefore deemed incapable of negligence as a matter of law. The child's immaturity limits his liability regardless of whether, as a litigant, he is the plaintiff or the defendant." Id. at 236. The court noted that had the child been between the ages of seven and 14 a jury would have been asked to consider the child's conduct considering his "age, capacity, intelligence, and experience." Id. at 238. Between seven and 14, the presumption that a minor is incapable of negligence is rebuttable. Once a person is over the age of 14, in Illinois he or she will be held to the same standard as an adult. However, under the facts it was asked to consider, the Appelhans court held that the five year old defendant could not be found guilty of negligence. In Illinois, the parent-child relationship does not automatically render parents liable for the torts of their minor children. Parents may be liable, however, if they do not adequately control or supervise their child. To prove a claim of negligent supervision, a plaintiff must show that (1) the parents were aware of specific instances of prior conduct sufficient to put them on notice that the act complained of was likely to occur and (2) the parents had the opportunity to control the child. In Appelhans, the plaintiff did not allege that the parents were aware of their son striking anyone with his bike on a previous occasion. Therefore, they could not be held liable for the woman's injury. The court stated that, "We conclude that holding parents strictly liable for failing to prevent their child's negligence is unreasonable and unsupported by the law." Id. at 240. Notwithstanding the facts alleged in Appelhans, I am inclined to believe that five-year-olds rarely cause harm to others while learning to ride their bikes. Certainly, they pose a much greater risk to themselves then to others. Unless they know that their child is prone to exceptionally devilish conduct, parents need not be too concerned about liability arising out of their young children learning to pedal around the neighborhood. Cheap Bicycle Helmets May Offer Adequate Impact Protection, But. . . The Bicycle Helmet Safety Institute recently conducted a study designed to determine whether cheap bicycle helmets, of the kind you might find in a department store, offer less protection than more expensive models. The study found no difference with regard to impact protection. But let's be a little careful here. Fit is important, and the study did not take that factor into account. Bicycle helmets have changed enormously over the years. A few months ago I replaced a helmet I've had since the mid-'90s with a new model. The latest helmets stay in the proper position on the rider's head much better. That means that it is likely to be where it is supposed to be when you bash your coconut against something hard like a windshield. Sometimes you have to pay more for a helmet that fits better. Also, let's not kid ourselves; many of us are vain. I am. If you (or your child) are more likely to wear a helmet because it looks like the latest and greatest, well then there are worse things on which you could spend your money. To help facilitate creation of transportation infrastructure that will accommodate all users -- pedestrians, bicyclists and motor vehicles -- the League of Illinois Bicyclists will conduct bike planning seminars throughout the winter. According to the League, "Everyday decisions by planners, engineers, and others affect how safe and convenient it is to bike for recreation or transportation. The seminar, a condensed version of LIB’s Summer 2009 four-week University of Illinois-Chicago urban planning course, will familiarize attendees with car/bike interactions, relevant national standards, best practices, planning tools, related “political” issues and policy techniques, tips on available funding sources, and implementation strategies." The seminars will take place throughout the state, and in St. Louis, at various times. Click here for dates, times and locations. The City of Brotherly Love has been not so much lately. Ever since two fatal accidents involving pedestrians and bicyclists in Philadelphia, tempers have gone through the roof. This week the Chicago Couriers Union blog posted a thoughtful synopsis of goings-on there. Also, yesterday's New York Times' Spokes blog outlined some of the proposed legislative backlash these unusual incidents have triggered. League Releases List of "Complete Streets"
The League of Illinois Bicyclists has released its 2009 "Complete Streets" list for the Chicago area. Since 2007 the League has annually released its list of recent roadway projects yielding streets designed to accommodate bicycle, pedestrian and motor vehicle traffic. The League is firm in its belief that a street is "complete" when it is "designed to enable safe access for all users." Of the 46 Chicago area road designs analyzed only six received A ratings. These included roadways in Skokie, Schaumburg, Worth, Algonquin, Hoffman Estates and LaGrange.